Please note that this post was updated on the 26th of November. Updates are marked in Italic bold font. BlogTV, the live streaming pioneer, is facing both opportunities and challenges. BlogTV’s CEO, Guy Eliav, defined and executed a brilliant strategy to increase traffic. In a targeted marketing activity, he managed to convince some of the brightest stars in YouTube to start live broadcasting in his network. This activity and others enabled the company to grow its audience considerably, as the graph above clearly shows. It seems that under Guy’s leadership, the efforts bear fruits. They also claim to get in some cases $10-$12 CPM for ads in some of their star broadcasters. BoinxTV, a software video mixer with high end features, is about to be released in November 11th. The product, by the award winning company Boinx, is pushing the envelope in semi-pro video productions and live events. 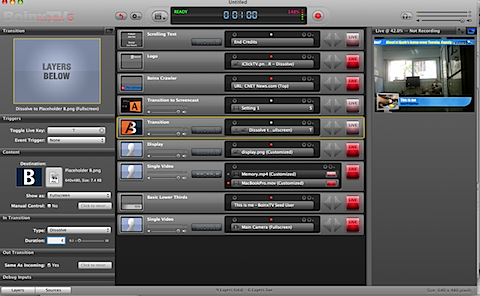 The product enables users to mix up to three sources (pre-recorded media, or live cameras), add transitions, lower thirds, overlays, logos, and live elements to the video feed and record it as a quicktime file or upload it to Apple’s podcast producer. When you launch the software, you can chose a show template – news, hi-tech, sports, or blank template. Based on your choice, a complex and unintuitive interface is opened, that allows you to define which overlays should be used, titles, lower thirds, transitions and logos. Though filled with options and out of the box graphics, it took me a while to learn how to operate this tool. Having said that, it is still much simpler (and cheaper) then learning After Effects or other post production tools. 1. It doesn’t support live broadcasting – unlike CamTwist, BoinxTV is only for recording media, not live broadcasting. This is a major disadvantage as its live mixing abilities are impressive, and could make the life of blogtv and ustream broadcasters much simpler, and improve their production value. 2. The interface is not easy to use at all. it took me a while to get the UI concept – even though Boinx make some amazing apps. 3. Many of its features can be found in free alternative, though online, such as Mogulus. 4. And on a personal note, I don’t really like applications which promise too much before they are able to deliver it. They do make post production easier, for a very specific segment of users, but this is still not a substitute for post production applications such as After Effects. Therefore, their notion of “Say Goodbye to Post Production” is a little overdoing it in my opinion. You can follow the application’s twitter account, watch an interview with the company, and read more about the application here. Using the Internet and IP technology to deliver video services has dramatically changed the end user’s experience in both choice and control. Video options abound, from special interest portals and closed circuit programming to the new intelligent set-top devices that use computer processing to deliver rich digital options. What will these options mean to the access carrier and what does it mean for the future of content delivery? What will keep them coming to TV, when will they turn to the computer? Will changing viewing habits continue to change the options for video delivery? Will picture quality play a determining factor in the success of these new services? Integrating video into social media applications seems to be a natural fit. New online video sites are beginning to shift more toward community-oriented platforms, where people with common interests can experience video content with complete social networking functionality such as chat, text messaging and interest profiles. This panel examines the viral growth of social networking in combination with traditional broadcast media, user generated content, live broadcast and video chat and how it will affect our viewing future. Who will be attracted, and what are the benefits of online video to the social networker? Who are some of the companies today providing online video and social media? What online video advertising models will take effect in community sites? A panel discussing the issues in implementing cross vendor communication solutions for video conferencing and unified communication. This panel will address how to extract content from enterprise communications and insert content into both communications and collaboration within the enterprise. This covers everything from conference recordings to social network content, and there are a few standards, but this is mostly unknown territory. The focus here is not on solving the problem in the panel, but identifying how critical an issue this is, and what the major challenges are. This session will explore the state of Social Communications. If you are attending the event – email me at kfir@pravdam.com, or sms me at +972-544-9458066 and let’s talk! Josh Lowensohn from webware introduced me to a cool new application, that gives the concept of one man show a whole new perspective – Tjoon. The site is a split screen video recording system. what makes it interesting is the application itself – The site offers musicians to record themselves playing different instruments, and create a clip composed from all instruments. I find it pretty cool – though it is an extremely niche application. Doing such a thing with Ustream though can be pretty cool (most live broadcasting solutions offer 2 hosts only). In any case, if any of the founders are reading this post – please contact me, I’d love to hear more about your project. 2. “Upcoming” section – the most interesting feature is the new Upcoming part of the site. Sources in the company see this part as key to success of their site.This section will show in the feature shows users might like based on their preferences, their friends preferences and editors choice. 3. Featured shows section – handpicked by the editor, this section will help to promote new shows. Company sources believe that these features will create what they refer to as the first live Internet TV listing, and improve their position in the market. It is interesting to see that BlogTV see content discovery as key to their success. Time will tell if this is another battle in the feature war against Ustream and operator11, or a knockout from BlogTV side. Somehow it seems to me that switching costs are so low in this market, that only brand and strong community tools can create a real differentiation in this market. UPDATE – the company also launched a new Facebook application. The most interesting feature there in my opinion is the ability to see if any of your contacts are now live, and the ability to notify your friends easily on your show. See Techcrunch post for more details. What's the real business potential of Personal Broadband Broadcasting? I’ve written a lot lately on products that enable users to broadcast themselves live over the interment. These products are mature enough to be used by almost everyone, and hype is building up in this field, slowly but surely. But what is the real potential of this segment? Are we looking at companies that will become the next YouTube, or at a niche market segment with limited growth potential? The difference between live broadcasting and edited content is a major one. While edited content allows creators to correct their mistakes, add visuals to their content and create an overall better experience for users, live broadcasting requires special kind of creators – ones who can immediately respond to their audience, talk fluently on a specific topic and interact on the fly with viewers and co-hosts. Therefore, I don’t believe we will see as much traffic and content in live sites as in the YouTubes of the world. Add the fact that live content usually does not contain copyright infringing material, and you get a content arena with original content only, most of it by unknown creators. What kind of usage pattern will increase the economic value of this medium? In my opinion we should not look at this medium as a stand alone technology, but as another tool in new media creators’ tool box. I’ve started a discussion about different ways to use this medium here. Companies that will tailor their products to the specific needs of their customers, rather then leave the platform as a general purpose site, can increase both usage and loyalty. Another way of increasing the economical value of this medium is by helping Indie creators use it as a part of covering live events – just like any other news organization. Technology provider that will embrace Indie content creators, and enable them to cover events of their interest, will create a new kind of media arena – independent and alternative live coverage of niche events. Companies can encourage users to use their platform by providing them with specialized equipment such as wireless cams, to cover high profile events. Creativity, like in other area, is the key here. There is no single answer to the question I’ve raised in the headline of this post. However, one thing is certain – plain feature wars are not the answer for creating economic value in this emerging market.